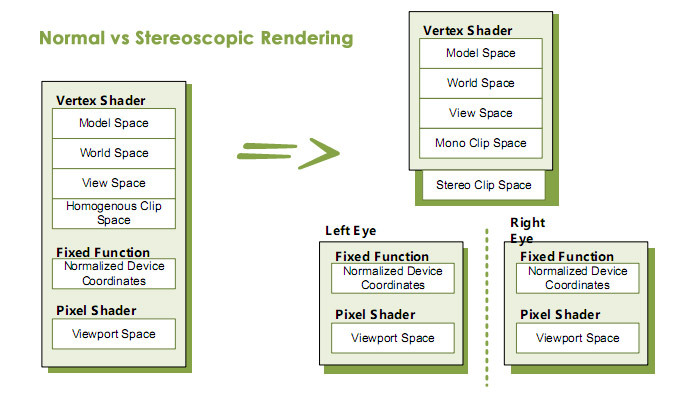 Nvidia has released a best practices guide for software developers that is intended to help them deliver the best possible stereoscopic 3D experience to their users. The guide contains an overview of how the automatic 3D Vision technology fits into existing technology stacks, common problems that arise when using the solution for automatically providing stereoscopic 3D mode in games, and most importantly how to easily work around those issues. It is not that hard to make sure that the software you are working on, being a game or other 3D application, is going to be rendered correctly when displayed on a 2D surface such as a computer screen or projector or being shown on a stereo 3D capable display. And why not to devote some attention to the most common issues that people that already play games in stereo 3D mode on their PC do hate to see in new titles and this is making them not want to buy a game, just because it is not working well in stereoscopic 3D mode. Of course Nvidia is not the only player in the stereo 3D market for PCs, but their 3D Vision technology is still the most popular one and quite a lot of their recommendations to avoid certain potential problems do apply for other solutions as well. Game developers are already starting to see the potential that stereo 3D gaming can bring and are slowly going in that direction, but besides titles that are specially worked on to ensure good 3D compatibility or to provide native stereo 3D support, still for most other games there is no attention whatsoever dedicated to ensuring that they can be comfortably played in stereo 3D mode. Nobody is talking to have them completely issue free as this also may require additional testing and development meaning more time to market, but by following some basic principles and not going through the “shortcuts” in making things faster or easier, just because nobody will notice in 2D does not mean that it will be the same when you play the game in stereo 3D mode… or at least when you try to. So if you take care of the basic stuff to ensure lets say good compatibility with the automatic stereo 3D solutions for PC gaming, then later on you can release patches to improve things for the constantly growing stereo 3D community by also getting feedback from them. This process of learning on the go from each other may help a lot in speeding and widening the adoption of 3D technology as well as getting more and better 3D content, so does it sound like a win-win situation to you? And as it is said “Content is King”, however 3D content is still lacking behind the big amounts of different 3D-capable hardware base that is constantly increasing and things should go hand in hand. But enough rambling on that, if you are interested in what tips Nvidia has for the developers wanting to ensure compatibility with 3D Vision you can check the guide in PDF format. You can also take a look at another new guide, also intended for developers, that is covering some specifics regarding the more recent Nvidia Surround technology that users three monitor or projectors in 2D or stereo 3D mode to provide bigger visual workspace which can lead to better productivity or more imemersive gaming.